New Delhi, Nov 2 : In a rare move the tigers have emerged victorious over strategic concerns. bio-diverse region of the state. The BSF had proposed to bifurcate the Dampa Tiger Reserve on India-Bangla border to check possible infiltration and cross border smuggling. Around 500 sq km of the reserve is in India and remaining in Bangladesh. The wild population moves freely between the two countries and the state government had been reluctant to give permission to build a three-line fencing. 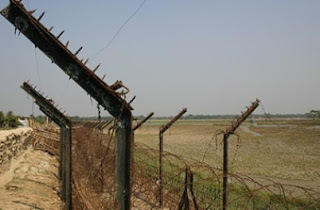 The BSF brought the proposal before the standing committee of National Board for Wildlife (NBWL) to allow fencing up to 1,500 yards wide and 62 kms long inside the tiger reserve. Along with fencing permission for a patrol road and to set up 13 border check posts was also sought. It would have meant felling of 7,271 trees. The committee asked one of its members MK Ranjitsinh and National Tiger Conservation Authority (NTCA) secretary Rajesh Gopal to conduct inspection and suggestion a remedial measure to consider important proposal in view of requirements of "national security". The committee in its report to the government said that the patrol road and the border checkposts should be on the Bangladesh side of the fencing so that the tiger reserve remains a compact wildlife zone. "There are no concrete or reliable reports of movement of insurgents and illegal migrants from this part of the international border" the state government told ministry.